In a small bowl, stir together cream cheese, blue cheese, garlic and salt until smooth; spoon about ½ Tablespoon of the cheese mixture into each piece of celery. To serve, arrange stuffed celery on a plate, drizzle each with about ¼ teaspoon hot pepper sauce (or let guests add their own by serving the pepper sauce on the side). Sprinkle with chives if desired. 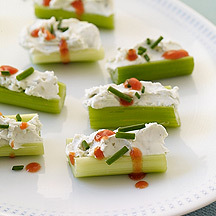 Yield: 2 pieces stuffed celery per serving.